So is there no fact, no event, in our private history, which shall not, sooner or later, lose its adhesive, inert form, and astonish us by soaring from our body into the empyrean? Cradle and infancy, school and playground, the fear of boys, and dogs, and ferules, the love of little maids and berries, and many another fact that once filled the whole sky, are gone already; friend and relative, profession and party, town and country, nation and world, must also soar and sing. How typical of her, I thought. A former English teacher and lifelong educator, she always sees the positive and the applicable. “I think it’s about loss,” I said. So there. Was my take that dark after all? Emerson’s quotation is used as the epigraph for a memoir I’m reading, A Girl Named Zippy: Growing Up Small in Moreland, Indiana, by Haven Kimmel. Just before reading Emerson’s quote, I’d been telling Kathy that it pains me that I never experience a specific reading pleasure I had as a kid—and have forgotten really what it was. I’m not talking about the childhood experience of losing oneself in a book. It was after that phase. I can remember being delighted by something authors did. Maybe it came when I saw how a writer was working out plot, or making a joke based on information previously given me. I still appreciate that. But is the pleasure less keen because I’ve grown to expect it? Or because I now routinely absorb how narratives work? Or because it was something else, something now lost to me as an experience? Beats me. But isn’t so much of spirituality about recapturing the ability to appreciate simple things? And do we enjoy some things more—maybe not playing with pebbles on the sidewalk, but what about a fine day in early spring? What about a sweet old dog? I guess the experience would be somewhat different, if nothing else given the difference in size between a five-year-old and a fiftysomething: my terrier, a lapdog to me, would be huge to a toddler. So I can’t recapture his wonder, and he can’t yet have my quiet pleasure that comes partly from having known other dogs. Maybe you can still see your lost joys in your kids or grandkids or nieces and nephews? Maybe you’re still trying to maneuver the kids into position to experience them? “The American Scholar” was the title of an address Emerson gave in 1837 to Harvard’s Phi Beta Kappa Society, which named its publication for the speech. It’s an intriguing source for an epigraph for any memoir, and especially for A Girl Named Zippy. Interestingly to me, when I turned just now to the Reading Guide at the back of Zippy one of the questions implies that Emerson’s meaning relates to the embellishment of memory. I don’t get that at all. But maybe Kimmel, or someone for Broadway Books, is pointing out that Zippy is a work of humor as much as of memoir, and therefore its story is somewhat embroidered? To me, Zippy‘s exaggerations are as obvious as they are hilarious. It is funny, dark, and true. At first I feared the memoir would be too cute, and worse, sentimental. Then I hit the humor and was laughing out loud and trying to read it to Kathy. Then I worried that there was no narrative drive, but hit the dark notes and undertones. Zippy is quietly dark, because we see what she can’t quite make sense of: her father’s gambling addiction, her mother’s depression, her brother’s anger. But it is mostly funny or at least amusing. The dark notes will please some, like me, and be too much for others. As I said, they’re what kept me reading. 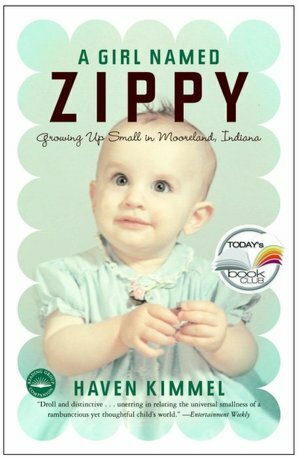 I gave this book four stars and not five on Goodreads, however, because the darkness notwithstanding, Zippy has little plot other than she’s getting slowly older in the course of the story. So, for me, it is not quite dramatic enough. And without some type of unfolding drama it can drag a wee bit. *You can read the full text of Emerson’s speech here at Project Gutenberg. It was good to hear of Kathy. How delightful to have yin and yang riding along in the same car. Together you are one? And, for the record, I do believe opposites in temperament attract. I asked a friend who’s an evolutionary psychologist about that and he said, “A mated pair is seeking psychological balance in their offspring.” So there . . .
Another great post. Your thoughts continue to resonate with me at so many levels. Writing memoir while taking care of a one-year-old grandson makes me say “yes” to both of your perspectives on the Emerson quote. But I would offer a third perspective and say it is all about gain, resting my case on the first sentence and thinking about the empyrean at the end of all our losses. Northrup Frye, in the Anatomy of Criticism, talks about the spiritual quality of great comedies. At their highest level, they are about resurrection, though that’s language he does not use. Thanks so much, Shirley. I thought as I prepared it that this post was for you! Wow, what a beautiful quote. I’ll have to read the rest of the speech. It sounds like you and your wife have some wonderful, thought-provoking repoire going on. Thank you for sharing. Emerson’s imagery in that quote is encouraging to anyone who attempts memoir. The thought that the smallest of our childhood memories can soar to the heavens and achieve some lasting, iconic meaning is sobering; that the details of our lives, through and beyond “friend and relative, profession and party” into that frontier that is old age can “soar and sing” causes me to grip my pen tighter and refill the well. p.s. 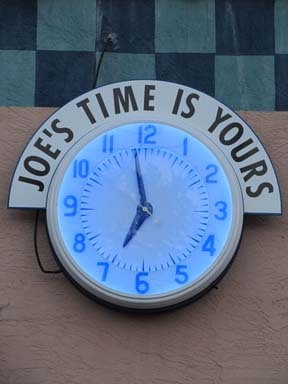 The clock from Joe’s Garage is great!